Swirl Fans quietly provide an almost silent rain of confetti that can be localised or spread to cover an entire stage or TV set by simply hooking onto a truss bar. You'll see exactly this effect at the end of some of TV's most popular Saturday night shows and on stage with some of the biggest touring Artists. Professional and efficient and just at home in a Theatre, Festival Stage or School Gym, swirl fans are great for Confetti or Glitter drops, 'dry' Rain effects and poppy or butterfly drops. Swirl Fans are also the best 'dry' snow machine on the market and with our special 'snow' confetti can create anything from a snow flurry to a blizzard with no sticky residue. 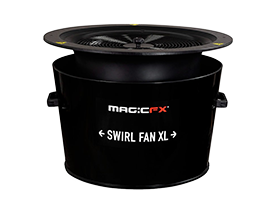 Available for dry hire or with a technician, Swirl Fans are available in both Standard and XL sizes, a standard swirl fan will carry 1 kilo of confetti and XL size fan up to 4 kilos.